With the system to heat swimming pools by solar energiía Enersoluz can enjoy your pool for months without any additional cost because it only uses the sun's free energy. 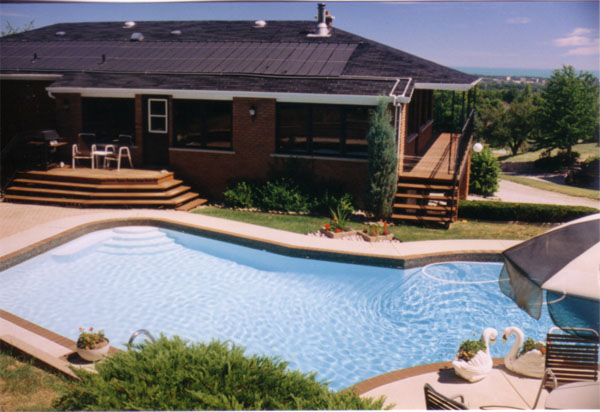 The system uses the same skimmer pump for operation, so that no extra expense of electricity, also regulates itself to keep your pool at the desired temperature. You simply need to select which you want to bathe temp and he will handle everything. You have spent more than 15,000 euros in your pool and can only use it for 3 months a year, gustariía you not to enjoy your investment for 7, 8 or even 9 months a year paying for it just over a tenth of what cost?. If the air-conditioning in our solar system, you can do it with confidence. The system consists of pipes connecting the connecting elements and locking, solar controller and solar collectors. According m2 surface in the pool, you need a larger or smaller system, calúlelo when making a purchase. We can send the system ready for installation or if you prefer, we can send one of our technicians who will visit you at your home when you want, do a detailed budget will leave the system ready for use. Motorized 3-way valve or auxiliary pump. The collectors are guaranteed to age 5.